The Loyalty Fusion Chamber allows you to convert the Season 1 cards in your collection into Season 2 cards and Enhancements. Go to “Fusion Chamber” in the game’s main menu. From here, you have several options about what type of card you want to create with your Season 1 content. Now, if you’re trying to generate a specific Loyalty Card, you’ll need a Core Card. Core Cards are very specific to each rarity tier. The card used in this slot will allow you to preserve that specific Superstar or Diva card -as well as that card’s particular image from said card- from Season 1 and convert it into a Season 2 card. For example, if you put a Season 1 Survivor John Cena card into the Core Card slot, you’d receive a Season 2 Super Rare John Cena card with same image from the Season 1 Survivor card. Any Season 1 cards that you use as ingredients in the Loyalty Fusion Chamber will be consumed and will no longer be available for play. 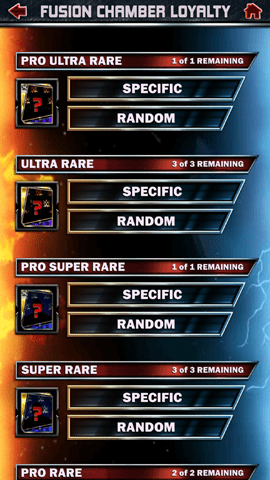 In order to still be able to play Season 1, you will need a minimum of four Superstars, one Diva, and two Support Cards from Season 1. If you don’t have enough Season 1 cards in your collection, you won’t be able to play Season 1 Exhibition.